they shall be as white as snow." Pull the cuff of the sock over the bottom of a paper tube such as the one from bathroom tissue. This makes a convenient funnel for filling the sock with rice. Fill the sock with rice to just past the heel to make the body. . Drop in a few pieces broken from a cinnamon stick to give a nice aroma. Use the cotton thread to tie off that section, so that the top section is centered over the lower section. Tie a knot, then wind the thread around to the other side and tie a second knot. This insures that the rice will not spill. Next, fill the sock to the bottom of the cuff to make the head. Tie this off in the same way. Fold the cuff down to make the hat. Cut a strip of fleece about one inch wide and nine inches long. Make vertical cuts in the ends to make a fringe. Tie this around the neck for a scarf. Use permanent markers to draw the face features. To use, heat the snowman in the microwave about thirty seconds. Do not overheat. Hold the heated sock snowman in your hands to relieve cold or aching hands. Caution: Do not use rubber bands or any materials that are not microwave safe in the construction of the sock snowman. 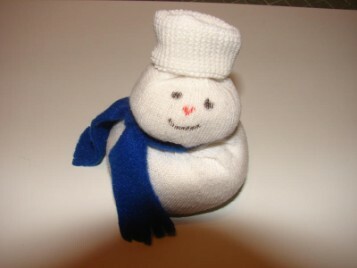 A larger sock snowman is made from an adult sock. If using a tube sock, use about two thirds of the lower section of the sock for the body. The section between the body and cuff will be the head. For the ambitious, facial features can be embroidered. No rice? Try using oatmeal as a filler.